Flushing isn't something we think twice about. But installing low flow toilets in your home will lower your monthly water bills for years to come, making these low flush water saving toilets worth considering. Did you know that flushing alone accounts for up to 40% of your total indoor water use? Our toilets are luxuries that at times we fail to appreciate. That is until we have a plunger in our hands, we have all been there before. 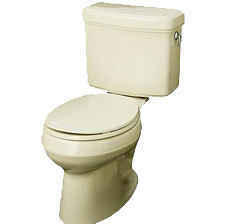 With that said, in many American homes today outdated toilets can use from 2 to 4 gallons of costly water per flush. And then consider that only 1.6 gallons is actually needed to properly flush. What a waste of water and money. In fact replacing just one 3.5 gpf toilet with a 1.6 gpf low flush toilet would save a family of 4 up to 16,000 gallons of costly water a year. Most toilets have the gallons per flush, or GPF, rating stamped in paint near the space between the bowl and the tank. So take a peak and see how your current toilets compare. By 1995 all newly manufactured toilets are required to use a maximum of 1.6 gpf. Today many new low flow toilets are even more efficient, using less water than 1.6 gallons to flush. And some of these new water saving toilets use as little as 1 gallon per flush, or even less. With just a push of a button, new dual flush toilets allow you to customize your flush by using even less water per flush than standard low flush toilets, saving you even more on your water bills. There are several different types of water saving toilets. Some models perform differently and are more efficient than others. Choosing the best flushing toilets for your home requires understanding these differences. It's also important to note that before you can confidently compare low flow toilets, there are other important features to consider in order to ensure that you select the best toilets for your home. Maybe new water saving toilets are not in your near future. There are other actions you can take today to improve the efficiency of your toilets and lower your water bills. Older toilets are very prone to leaks; it's true that some of these tank leaks are small, but they are sure to have a continuously negative effect on your water bills. Even the smallest leaks can be detected by a toilet tank leak test. It's a fast and easy way to pin point the potential problem and stop the unnecessary drain from your wallet. Installing a new flush valve or toilet flapper into your toilet tank is a simple and very inexpensive way to stop and prevent future leaks. If you have older toilets chances are you have a ball and joint, or ballcock, filling system in your toilet tank. Lift and remove one of your toilet tank lids and take a peak for yourself. These outdated tank filling mechanisms are very inaccurate and prone to leaks. New toilet tank fill valves are considerably more accurate, more durable and easy to install.